Conceptualized by an all-star creative team, Frank The Man The Music has been called the most authentic re-enactment of a Frank Sinatra concert ever performed on stage. The 90-minute production stars Bob Anderson the most revered singing impressionist in the world accompanied by a lush 32 piece orchestra. Anderson takes on the appearance of Frank Sinatra and depicts three distinct areas of his music; the recording studio, television specials, and personal appearances. The show takes the audience back in time to experience an evening unlike any other today. This quintessential salute to the greatest singer of the 20th Century will contribute to sustain his enormous popularity, as well as the music of The Great American Songbook which he made so famous. Use code BDAY for 2 for $99 special! The absolutely outstanding orchestra with Vinnie Falcone conducting and the lighting were exact reproductions of 1950 stage. Beautifully composed masterpiece of a show. It truly was like stepping back in time. But the most perfect look was Bob Anderson's impersonation of Frank Sinatra; the voice, the gestures, the outfits, the facial expressions, modeling Mr. Sinatra to the tee.!!! While he was singing I was wondering what kind of music my Dad was listening to at that time in his life. The thought of a certain song came to mind, and to my surprise Bob Anderson began to sing that very song! My hair stood on end, realizing he read my mind singing two beautiful Brazilian Bossa Nova songs. I can't say enough about Bob Anderson's incredibly performance. Very entertaining! I highly recommend it. 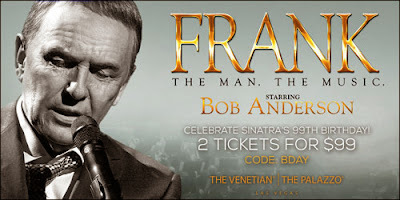 If you're visiting Vegas in the near future, as I know many friends are coming for Viva, I Would suggest seeing Frank. The man. The music. It is at the Palazzo. This show stars Bob Anderson who does an amazing job singing the Chairman's songs. He is accompanied by a world class orchestra. The horns, the strings, the percussion...everything is arranged so well. At one point in the show, they recreate the Capitol recording sessions, and the audience is the proverbial fly on the wall. I felt as if I was witnessing Sinatra at work with the most talented musicians of the time. As the night continues, Bob interprets the Capitol years of Old Blue Eyes as Frank. Reality may not be suspended, but Mr. Anderson takes you to some fairly lofty heights weaving story with visual and aural experience.